Since the death of her mother, Hannah's family life has been chaotic. I know, I know. Did you think I could possibly find any more books where a parent has died? Well I have, and this one is a little gem. Hannah and her family, sisters Jo and Martha, brother Sam and Dad live on Clayhill Farm. Times are tough, working the farm is difficult, and money is tight. Hannah's Dad never seems to be happy, he has to work all hours just to stay afloat, and when suddenly a developer wants their land, and doubles their rent, in the hope they will have to leave the farm, it looks like they might loose everything. Hannah does love her farm, but what she really loves is drama. Her Dad thinks acting and play writing is a complete waste of time. So when the chance to enter a local drama competition arises, Hannah has to do everything in secret. This includes turning an old disused hen house into their very own theatre. I was never as dedicated or creative as Hannah or her friend Lottie, but I loved putting on shows with my brother and neighbours when I was young. When we stayed at my Nanna's house in the summer we used to dress up, put on plays and magic shows. We didn't have anything as fancy as Hannah's hen house, we used sheets tied to the old hills hoist clothesline that we would spin around to reveal ourselves behind the 'curtain'! 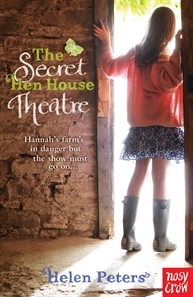 Hannah's plan to save the farm is to win the five hundred pound prize money, but things don't go quite to plan. And she also finds out that five hundred pounds isn't going to make a dent in the thousands that needs to be paid each quarter. This story has so much going for it. A young girl, who wants to be just that, but also has the weight of the world on her shoulders with the loss of her mother, potential loss of their home and a Dad who she just can't talk to anymore. She also had the regular school yard dramas to contend with, getting her homework done on time, bullying and having a crush on the most unsuitable boy!